24/7: Cottage Connection manages vacation rentals 24/7-we respond quickly and professionally to guest inquiries, vacationing guests and homeowners. Also, we respond to emergencies 24 hours a day. We provide all guests with our after-hours emergency number and we post important information in all vacation rentals. Guest Services: From reservation inquiries to secure, online booking; from check-in to repair calls; from concierge services to housekeeping, home and grounds maintenance and inspections; Cottage Connection takes care of guests and vacation homes 24 hours a day. Marketing: Who knows better how to market your vacation home than a professional manager? We live here, we participate in our communities, and we are involved in tourism efforts to promote the region. Local events, holidays and seasonal opportunities are promoted to guests year-round. We maintain and market to an established customer base of thousands of guests who often return year after year as repeat customers as well as referring their friends and family to Cottage Connection. Internet Marketing: We understand internet marketing including Search Engine Optimization and Management. Our websites are attractive, easy to navigate and up-to-date using real-time web-based technology for both our reservation availability and our booking calendar. We know how to help guests find your vacation home online easily when they are planning a vacation in the area. We manage email marketing to past guests, utilize social media marketing, listing sites like Flipkey and TripAdvisor and a variety of other internet marketing strategies that will lead browsers to our website: www.cottageconnection.com and to guests booking our vacation rentals. Promotion: Print, Internet, travel writer familiarization tours, email blasts, Facebook and Twitter, pre-arrival and post-vacation emails and direct mail, guest surveys, contests, television shows (the Cottage Connection/Boothbay episode of Getting Away Together on PBS was filmed at one of our vacation rentals), promotional trades, quiet season promotions, brochures and rack cards….as professional managers we are hospitality focused and promote our region and your home. Reservations Are Easy: In person, over the phone, by cell phone, via email or online – whether paying by check or credit card – Cottage Connection makes it easy for guests to book your vacation rental home in a secure, professional environment. Rental and refund policies are clear and professional. Guests receive detailed confirmation emails upon booking your vacation home. Additional Services: Travel insurance, security deposit protection, additional housekeeping services, tickets for the Botanical Gardens or boat rides, and much more…Cottage Connection offers guests everything they need for a great vacation. Housekeeping & Inspections: We contract with trained, skilled housekeepers who keep your vacation rental home cleaned to hospitality industry standards. Inspectors, as well as housekeepers, maintenance technicians and office staff, are in your home before and after every guest ensuring consistency and quality and keeping everything in order. Maintenance: We make sure all vacation homes are in good shape – safe, clean and in good repair. We offer professional maintenance services with a timely response to problems and after-hours requests for emergency services 7 days a week with our Basic Maintenance Plan. We use reliable vendors (electricians, plumbers, appliance specialists, chimney cleaners and so on) who are qualified, trained and licensed to handle practically any situation, even on weekends and holidays when the job goes beyond the scope of our staff. The damage waiver protection plan purchased by guests covers the cost of accidental damages during a guest’s visit. Money: As professionals, we help maximize the return on your investment property, earning you money when you aren’t using your vacation home. Professional marketing and excellent customer service earns guest loyalty and repeat visits. Records: We keep the records – from revenues to repairs to 1099s – you’ll receive professional, monthly accounting of what is happening at your property. We offer online owner access so information is available anytime, from any computer. Homeowners can review account information, rentals and revenues, make owner reservations and more. Communication: We let you know what’s happening – from property repairs and marketing initiatives to local issues and industry standards. We know the vacation rental industry locally, nationally and internationally and we’ll keep you informed. Security: As professional property managers, we are the constant “eyes and ears” for your property. Instead of sitting empty, vacation homes are lived in, checked and maintained continuously. We prefer to meet your guests upon arrival in our office and whether they come to our office or not we communicate with them throughout their visit as needed to assist with travel plans, recreation, where to eat and if a problem arises. Accountability: As your agent, we are primarily accountable to you, the property owner. All guests are required to sign a detailed guest (rental) agreement and review the policies. We primarily rent to families and adult groups over the age of 25. We do everything we can to protect your home. Local Connections: We maintain relationships with local officials and agencies – including the Maine Office of Tourism and the Boothbay Harbor Chamber of Commerce. We are constantly making sure our homeowners and guests are top of mind in our community. Audrey Miller, the co-owner of Cottage Connection, is the first president of the Northeast Vacation Rental Professionals NEVPR. This is the statewide association of rental managers providing a voice for vacation rentals in Maine. Melba Gunnison is the first chairperson of the governmental affairs committee of the NEVRP. Good Neighbors: Professional property managers understand the importance of being good neighbors. We maintain connections to property owner associations and your neighbors; we keep guests informed about neighborhood rules as well as local laws. We patrol our vacation homes in order to enforce policies that do not allow overcrowding of your home, house parties, parking violations or similar concerns. Local Advocacy: Cottage Connection keeps homeowners’ best interests in mind at all times. We advocate for protecting and respecting our environment and we participate in the local Chambers, take part in focus groups at the State level, and other local & tourism-related organizations. We sponsor and volunteer for local events and activities that have a positive impact on tourism. Consumer Confidence: Booking a professionally-managed vacation rental through Cottage Connection gives the guest’s confidence. As a member of the Vacation Rental Managers Association (VRMA) booking is a seamless process because nearly all members offer secure phone and internet reservation systems, and members have made a commitment to quality hospitality, professionalism, and industry excellence. Time: Cottage Connection saves homeowners time. We do it all so you can enjoy your vacation home when you come to town! 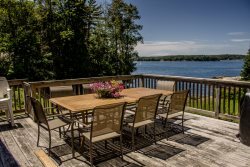 "..we use a NON-realtor agency called COTTAGE CONNECTION. They have been managing our cottage/house since 1998 and we love them. They are indeed a FULL-service agency with the highest standards we have seen. A leader in the vacation rental industry, they also have offered leadership to protect the cottage owners from excessive state government intrusion into regulating the industry..." Robert & Maria D.
“First of all the cottage is spotless! Thank YOU! It is such a pleasure to come into such a clean house…..thank you for all your help. I feel much more at ease now that my cottage is in your hands.” - Best regards, Sally J. “I really feel that our cabin gets better care than if we were trying to do it ourselves. You see what needs to be done and you know how to get it done while being cost-conscious at the same time.” - Kathryn I. “After 3 years of utilizing your services for the rental of our property, we want to express to you our gratitude for another year “well done”. Your guidance of us in our efforts to make our property more attractive to potential renters has resulted in financial gain for both you and for us. Our follow-through with your many suggestions provided us with a 100% increase in our rental activity since the first year of rentals. We have made improvements in the property that were not expensive but did take some energy on our part. It was truly worth it as we now are enjoying a productive rental season. We hope that you will continue to think creatively so that both you and we can benefit from our arrangement.” - Andy and Alice M.
“I just wanted to let you know again how much we appreciated and valued our week at Newagen Cove Cottage. Everything was, in a word, perfect (which is not a word I use lightly). Beginning with the website which was easy to navigate and which accurately depicted the remarkable array of cottages you offer to the warm, competent and accommodating staff who patiently answered all our questions….And a return to Maine, through the kindness of Cottage Connection, will be what keeps us going through the coming year.” - Felice K.
“I really want to thank you again for the high level of service you have provided. I am a hospital president in a small community hospital, so I really appreciate it when great customer service is being provided.” - Bill C.
“Memories of our stay at the cottage will never fade. Your staff tended to every last detail. It was great! - John and Mary M.